This page describes how to calculate percentages in Excel in three different ways. a Number E.g. What is 25% of 50? a Proportion E.g. if, out of 120 questions, you answer 90 correctly, how is this expressed as a percentage score? Change E.g. if your sales figures are $1,250 in January and $1,750 in February, what is the percentage increase in February, compared to January? If you want to calculate a percentage of a number in Excel, simply multiply the percentage value by the number that you want the percentage of. For example, if you want to calculate 25% of 50, multiply 25% by 50. - which gives the result 12.5. For further examples of calculating a percentage of a number, see the How to Calculate a Percentage of a Number page. If you want to calculate percentage as a proportion (i.e. calculate the size of a sample as a percentage of a full set), simply divide the sample size by the size of the full set. For example, if you score 90 out of 120 in an exam, what is your percentage score? The percentage score is calculated by simply dividing 90 by 120. - which gives the result 0.75, or 75%. Note that, to get the result shown as a percentage, it is necessary to set the cell containing the result to have percentage formatting. As with any Excel formula, the percentage calculation can use references to cells containing numbers, instead of actual numbers. This is shown in the Excel spreadsheet below. See percentage formatting section of this page for details of how to select further percentage formatting options. This percentage calculation is shown in the Excel spreadsheet below. As in the previous example, in order to get the result displayed as a percentage, it is necessary to set cell B3 of the above spreadsheet to have percentage formatting. Percentages in Excel are stored as decimal values. For example, 25% is stored as the value 0.25, 50% is stored as the value 0.5, etc. 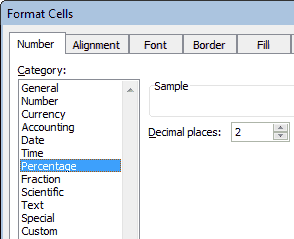 It is the formatting of a cell that makes the underlying decimal value appear as a percentage. If you want to change the number of decimal places that are displayed, click on the Dialog Box Launcher (shown above). This opens up the 'Format Cells' Dialog Box, which allows you to specify the number of decimal places to be displayed. Select the cell(s) to be formatted. Clicking on the Dialog Box Launcher on the Excel ribbon (as shown above). Right clicking on the selected cell, and from the right-click menu, selecting the Format Cells ... option. Ensure the Number tab of the dialog box is selected and from within the 'Category' options in this tab, select Percentage. From the Decimal places: option (which will appear on the right of the dialog box), select the number of decimal places that you want to display. The result of formatting (with zero decimal places) is shown below. Further examples of Calculating Percentages in Excel can be found on the Microsoft Office website.